Nanny Brown was born Alice Thelma Berneice Wells. She was the daughter of Thomas and Sarah Wells (nee Black). Her mother died from a heart attack when Nanny was only 4 years old yet her father lived to be 96. After her mother’s death, Nanny went to live with family friends, the Patterson’s. It was an almost unheard of thing in those days for a widow to try to raise a child on his own. The Patterson’s daughter, Addielil and son, Garfield, were like her own brother and sister. Nanny was particularly attached to her father, Thomas. We think it’s fair to say she idolized him. He was a very quiet man, who loved a good pipe. One childhood memory of him remains from a visit to the old homestead: his great-grand-daughter from Nova Scotia, tentatively approaching, the smell of freshly chopped firewood stacked outside the kitchen door, the morning sun lending it’s warmth to the back porch, and him, great-grandfather, quietly enjoying the sweetness of the first pipe of the day. An hilarious side-note: her father had quite severe asthma. Joyce remembers him using a folk remedy which Nanny believed, in retrospect, (and this has now gone into family folk-lore), was marijuana! He put the dried plant in a bowl, lit it, and placing a funnel over this, breathed in or “smoked” it. Considering marijuana’s acrid properties, it’s hard to believe it would have been efficacious for asthma. Nanny said he grew this herb in his garden and it apparently made him feel much better! Nanny was not afraid to consider this modern possibility, but who knows if it was that or some other more common and less noxious herb. At any rate, as a folk remedy it would certainly not have been an issue in those days. Eventually her father re-married to Sarah Hurd. 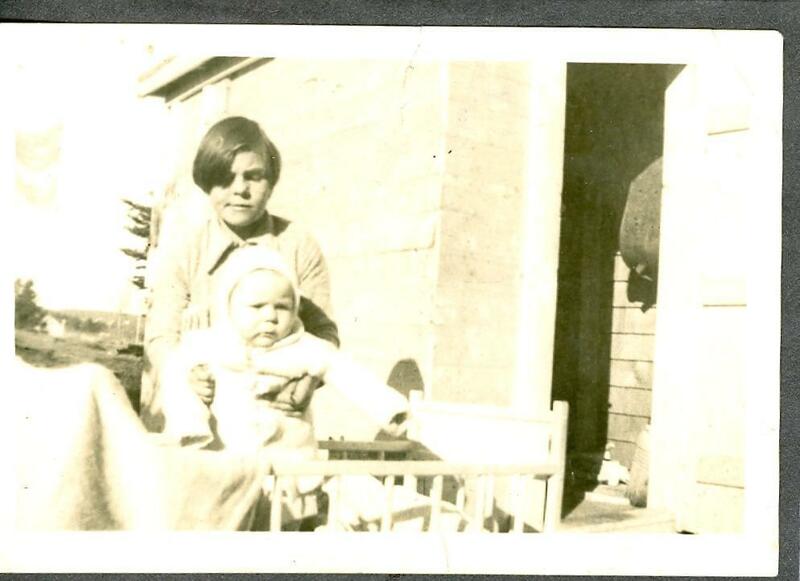 They had a daughter, Phyllis – a very sweet and gentle girl. She and Nanny remained very close over the years. 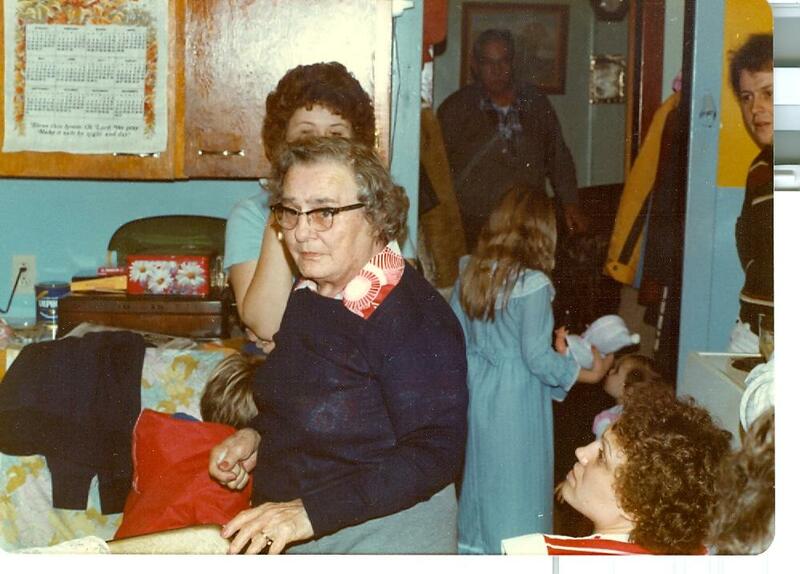 How Nanny loved her extended family. She kept detailed genealogical records that go back six generations. It is wonderful to look at that detail now and it is some small compensation for the dearth of information we have on Grampy’s heritage. Consequently, it was always a great consternation to her that her second generation didn’t have more curiosity about her Ontario relatives. Because she herself felt isolated from them, it was important that they remain a significant part of her family. She frequently talked to her grand-children about their heritage hoping we would have her sense of belonging to a larger group. It helped that Phyllis and some of her children were able to come to Nova Scotia now and again and Nanny was always glad to have that reconnection. When Nanny was fifteen, her step-mother, Sarah, insisted that she leave school to go to work. Nanny was heart-broken. She wanted to stay in school and become a teacher. For the rest of her life she remained an ardent reader, and loved history most of all. We remember Nanny always had a book “on the go”, most often historical, and she particularly loved to read about the Kings and Queens of England. Nanny went to work in the woolen mill in Orangeville, Ontario, where she met Grampy and married him in September 1925.�������������������� It was always cute to see them together: Grampy’s six foot frame towering over Nanny’s four foot eight. Even more amusing, seeing them setting out for an afternoon drive, Nanny barely seen over the dashboard.�� Yes, she was small, but most certainly she was mighty and determined. If she wanted something moved downstairs from upstairs, and you were slow to respond to her call for help, she would just let it go and hope for the best. On more than one occasion we can remember peeking around the corner in time to see her launch an item over the stairs and just having time to step back out of the way. Grampy later worked for the Standard Paving company who sent him to Nova Scotia to pave roads. When Nanny and Grampy arrived in Cape Breton, they lived in a portable cabin which was set up, then broken down and set up again as they moved around the Island and later the province. We remember Nanny talking about those happy days living in a one room cabin.���������������� From her perspective, what was not to like about having only one room to keep clean. Also, the Standard Paving work crew traveled as a group from place to place becoming very close and building bonds of enduring friendship that would hold throughout the years. Nanny was very sociable and she loved the intimacy of this amiable, traveling community. Nanny was a fantastic “scratch” cook but she fell in love with the new, instant products that were becoming more common place. Hand in hand with that went all the new gadgets: electric frying pans, electric can openers, toaster ovens, electric knives, and steamers, and things we weren’t even sure what they did, but she loved them all. Nanny also delighted in discovering new recipes. Over the years she collected volumes of recipe albums: really, photo albums filled with recipes from magazines, newspapers, and quickly jotted notes.�� And there were index cards, loose papers, even a blue penny scribbler from the sixties. This gem holds some favorite recipes handwritten by various family members, now a personal treasure of one lucky grand-child. (don’t even ask!) These collections include entries gleaned from family, friends, and neighbors, even strangers if she tasted your squares and liked them! Evelyn’s family lived right next door to Nanny and Grampy and every day included a visit to Nanny’s by several, if not every member of that large brood. Evelyn had eight children and it was the delight of each of us to go there for some “individual” attention which was not so easy to come by at home. 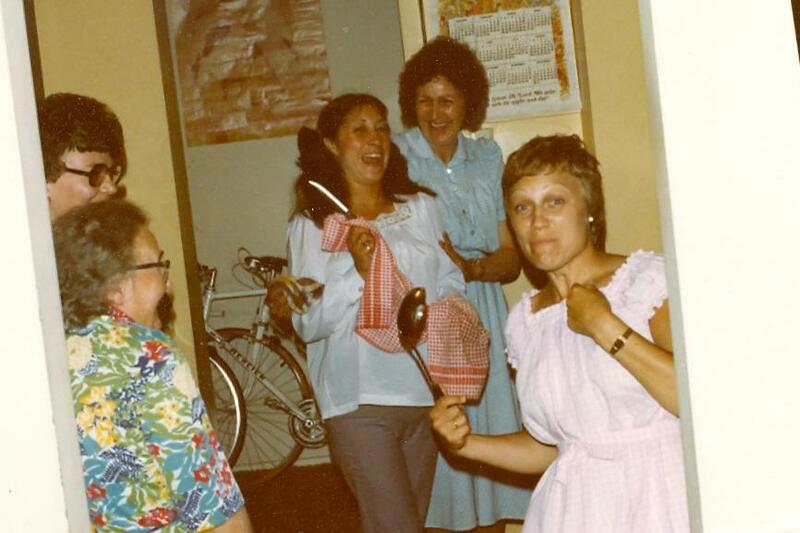 We all have memories of Nanny nurturing us: getting you cozy on the couch with a blanket and a pillow, t-biscuits fresh from the oven most every day after school, a good gab and more than one laugh, a sleep-over with “shoe-leather” fried eggs for breakfast,�� bedtime snacks, an evening playing 45′s, and on and on. Her gift was nurturing and she had plenty to go around for each of us. 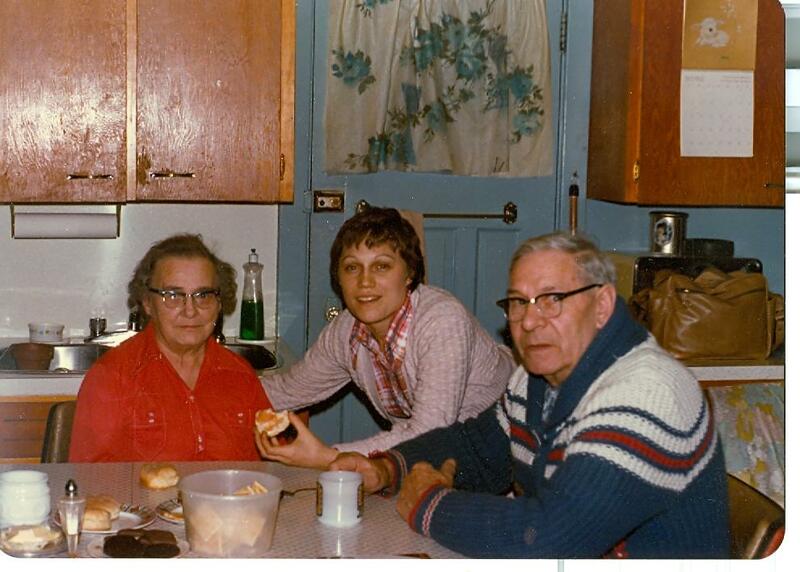 Joyce’s family with 2 children, lived in Spryfield but they faithfully arrived each Sunday for the day and dinner.�������� Whereas we had the ease and privilege of dropping in anytime, Joyce made her daily contact with a phone call each evening. It’s a tradition she continues today by keeping in daily contact with her sister Evelyn who now lives at Northwood Manor in Halifax. Nanny’s health declined over the years. She developed diabetes which in a strange way seemed a relief to her. She had a peculiar habit of making the symptoms of diseases she read about in home medical magazines her own. In reality, we supposed she knew she was not well and if the doctor couldn’t find anything wrong, then she would. In her last years, Nanny required constant care and assistance both from Grampy, who diligently watched over her, and from Joyce, living right next door. Nanny died in December, 1986 and we miss her still.�� She was our confident, encourager, nurturer and Grampy’s anchor over 61 years of marriage. The great success of their life was bestowing on their children and grand-children the sure and certain knowledge that we were loved.